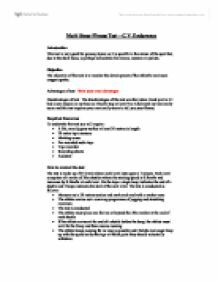 Multi Stage Fitness Test - C.V. Endurance. 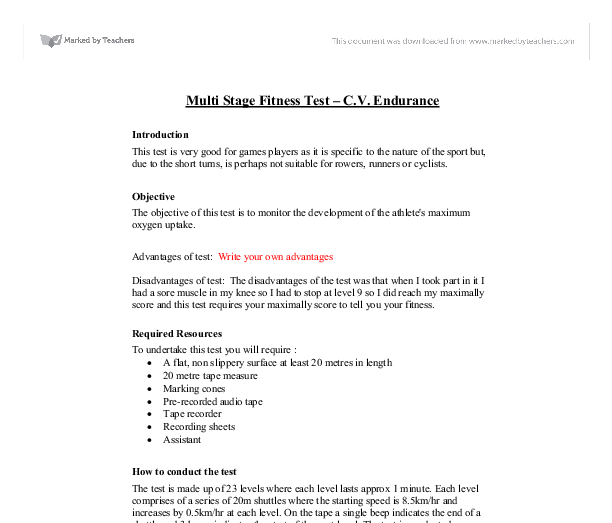 Multi Stage Fitness Test - C.V. Endurance Introduction This test is very good for games players as it is specific to the nature of the sport but, due to the short turns, is perhaps not suitable for rowers, runners or cyclists. Objective The objective of this test is to monitor the development of the athlete's maximum oxygen uptake. Advantages of test: Write your own advantages Disadvantages of test: The disadvantages of the test was that when I took part in it I had a sore muscle in my knee so I had to stop at level 9 so I did reach my maximally score and this test requires your maximally score to tell you your fitness. Required Resources To undertake this test you will require : * A flat, non slippery surface at least 20 metres in length * 20 metre tape measure * Marking cones * Pre-recorded audio tape * Tape recorder * Recording sheets * Assistant How to conduct the test The test is made up of 23 levels where each level lasts approx 1 minute. ...read more. Record the level and number of shuttles completed at that level by the athlete * At the end of the test the athletes conduct a warm down programme, including stretching exercises My Results I reached level 9, which is an average rating Ratings (level) Males Females Rating >13 >11 Excellent 11-12 9-10 Good 9-10 7-8 Average 7-8 5-6 Fair <7 <5 Poor Find the source for this ratings table Comments: My results are the average persons score, which is good, but I feel because of my knee I did reach my full potential, so the score is not as reliable. Illinois Agility Run Test - Agility Objective The objective of the Illinois Agility Run Test is to monitor the development of the athlete's agility. Advantages of test: Write your own advantages Disadvantages of test: Write your own disadvantages Required Resources To undertake this test you will require : * flat surface * 8 cones * Stop watch * Assistant The Illinois course The length of the course is 10 metres and the width (distance between the start and finish points) ...read more. * chalks the end of his finger tips * stands side onto the wall, keeping both feet remaining on the ground, reaches up as high as possible with with one hand and marks the wall with the tips of the fingers (M1) * from a static position jumps as high as possible and marks the wall with the chalk on his finger tips (M2) The teacher then measures the distance from M1 to M2. The test can be performed as many times as the athlete wishes. My Result - Add your results Ratings (cms) Males Females Rating >65 >58 Excellent 50-65 47-58 Good 40-49 36-46 Average 30-39 26-35 Fair <30 <26 Poor Find the source for this ratings table Comments Comment on your results Sit and Reach Test - Flexibility Equipment: Sit and reach box, marking slider. Target Population: Everyone without injury. Advantages: Simple to administer. Disadvantages: Only measures hamstring flexibility. Procedure: Add the protocol here Add the ratings table Add your result Comment on your result These examples are here for your guidance, use the information here to do the same for the remaining tests!! ...read more. Hand Down Spine 1. Extend one hand down the centre of your back, fingers pointing downward. 2. Use the other hand to grasp the elbow. 3. Exhale slowly, pulling gently downward on your elbow, aiming to take your fingers along your spine. 30 m test The 30 m sprint is the simplest way to measure the speed of an individual. The tester marks out the 30 m on a non-slip surface and the individual has to sprint as hard as he/she physically can. * Avoid training tired * Tie hair back to avoid entanglement * Increase rest when increasing training * Drink lots of water to avoid dehydration. * Ensure there are no hazards on the training surface. * Check all equipment prior to use * Allow lots of warm up and cool down time. In the 'sit and reach' test we tested our flexibility. My flexibility is average. Flexibility can be useful in hockey as it perhaps allows you to perform skills more easily. Although my flexibility is only average I don't find that my lack of it has a significant impact on my play. if the need arises for me to complete my programme via free weights when the gym isn't available then I shall have to adapt to the given situation. Reverse biceps curl: Sit upright, grasp weight with palms facing towards the front of your body. Once the paddle is in the water the trunk should rotate enabling an initial straight arm pull using the large trunk muscles (abdominals, external obliques). As the trunk rotates, the arm closest to the immersed blade should bend at the elbow (needing power in the bicep).